After decades of exclusion, more and more representatives with immigrant backgrounds entered parliaments in most Western democracies in the 2000s. The paper answers the question as to whether and under which conditions this development enhances policy responsiveness towards minorities of immigrant origin. My analyses show that growing numbers of legislators with immigrant backgrounds can succeed in shifting the parliamentary agenda closer to the ideal points of citizens of immigrant descent, but only within two important boundaries. The first boundary is set by the overall proportion of representatives with immigrant backgrounds: it must remain below five percent of the parliamentary seats. Only below this threshold, an increase in the number of legislators of immigrant origin from one election to the next enhances policy responsiveness towards people of foreign origin (see Figure 1 below). Above this negative critical mass growing within-group diversity and majority backlashes complicate the efforts of legislators of immigrant origin to change the parliamentary agenda. 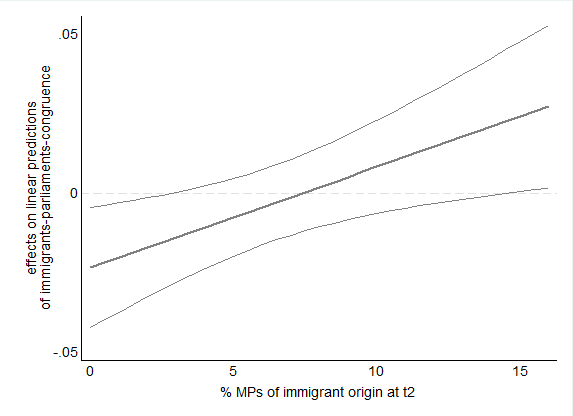 Figure1: Marginal effects of increases in the seat share of immigrant-origin representatives on change in policy congruence between parliaments and citizens of immigrant origin. Annotations: The thin lines display 95% confidence intervals. All details on data and modelling can be found in the paper. The second boundary is related to party discipline, because it undermines the capacity of representatives with immigrant background to set issues on the parliamentary agenda independently. To underpin these findings, I analyze panel data from seven European Democracies between 2002 and 2014 using first-difference models. This approach goes beyond existing studies by providing a first cross-country comparison in the field, and, furthermore, by moving the focus from individual representatives’ attempts to promote the interests of citizens with immigrant backgrounds towards effectiveness of these endeavors. Update 01/2018: If you would like to know more about these exciting findings, you can find the whole paper publised in EJPR here.